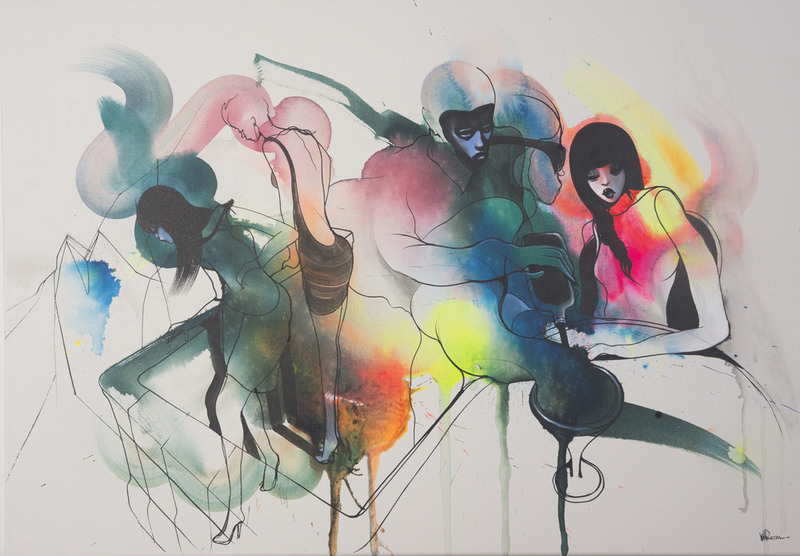 Will Barras is an artist, illustrator and animation director living and working in London. He grew up in Birmingham and moved to Bristol to study graphic design. Will became one of a new crop of young artists working within Bristol's world renowned street art scene. This led to Will appearing in 'Scrawl' the book, and alongside Steff Plaetz and Duncan Jago becoming a founding member of the Scrawl collective. 'Scrawl' originally published in 1999 was a seminal book documenting a new movement in street art, graphics and illustration. He was chosen as one of the original artists for the collective, noted for his representations of fluid movement, unique narrative driven composition and line work. This has led Will to travel extensively, painting and exhibiting his paintings in Asia, throughout Europe and the U.S.
"There is a fluidity and energy in Will's work that, although constantly changing, has always existed in a world entirely of his own making. His figures appear to be in a state of perpetual metamorphosis - caught for a brief moment between one manifestation and the next. always at the mercy of the swirling forces that surround them. From his early scanned and reworked doodles through to his recent, rich, mixed media work. Will has mastered every medium with a dynamism constant in all his work." Felix Braun. author of "Children of the Can"